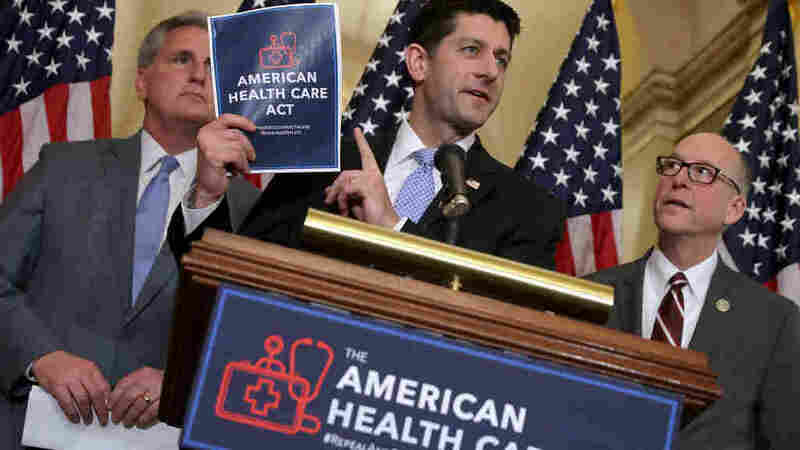 5 Charts That Explain The CBO Report On Republican Plan To Replace Obamacare See how the new health care bill would affect the uninsured, the cost of coverage and the federal deficit, according to a budget analysis. House Speaker Paul Ryan holds a copy of the American Health Care Act, the House Republican leadership's plan to repeal and replace the Affordable Care Act, which is already facing opposition from conservatives in the House and Senate. The Republican health care bill would not affect Americans equally. Older, poorer people would see big reductions in coverage and cost increases, according to a report from the nonpartisan Congressional Budget Office. This first step in the GOP plan to repeal and replace the Affordable Care Act, also known as Obamacare, would also create a modest deficit reduction. The report hands Democrats more ammunition in attacking the bill, while Republicans are divided: Some are playing defense, while others are backing away, and some are also proposing changes. To see the potential impact of the bill as it stands, here are five charts, based on the CBO analysis. First things first: The Republican health care bill would greatly ramp up the number of people who are uninsured. Currently, around 9.5 percent of Americans younger than 65 are uninsured. Under the Republican bill, the uninsured rate in 2026 would be nearly double that, at 18.6 percent, compared with 10 percent under the Affordable Care Act. Put into raw numbers, here's how the growth in the number of uninsured looks: In 2018, the number of uninsured would be 14 million larger under the Republican bill than under Obamacare. In 2026, it would be 24 million larger. That big upswing in 2018 would be largely attributed to repealing the penalties that came as part of the individual mandate — not having a fine would lead lots of people to decide not to get insured. In addition, rising premiums would deter some from buying insurance. In subsequent years, Medicaid changes would account for an increasing number of uninsured, eventually hitting 14 million. The rollback of the Affordable Care Act's Medicaid expansion would begin in 2020, cutting the number of people on the program. In addition, no states would be able to take up the expansion in the future, further dropping the number of potential Medicaid enrollees. The CBO's report shows that premiums in the individual insurance market would increase first, then decrease, ending up 10 percent lower than they would be under the current law in 2026. That's because young and healthy people would likely drop out early on, bringing premiums up. But the mix of people would eventually shift younger, pushing premiums down — younger people tend to be healthier, and therefore cost less to insure. In addition, insurers will not have the same requirements for sharing the cost of certain benefits. "Everyplace else where the market is allowed to function, quality goes up and costs go down," he said, "and I think if you look for something the CBO may have gotten right in this report, it's that the premiums are actually going to come down in cost." But it wouldn't work out the same for everyone. Many younger Americans would end up paying less, as would people young and old alike making middle-to-upper-middle incomes, according to the CBO analysis. However, premium costs would hit many low-income adults hard, particularly older low-income adults. A 64-year-old making $26,500 a year would pay around $1,700 in premiums right now. Under the proposed changes, that person would pay $14,600, more than eight times more. One big reason for that is that the new health care bill would change the gap between what young and old people will pay for their premiums. Currently, insurers can charge older enrollees three times what they charge someone younger. The Republican plan would up that from 3-to-1 to 5-to-1. The uninsurance rate will increase among the poor and nonpoor alike. But it appears it would grow the most — more than doubling — among older, low-income insurance buyers. Not coincidentally, that's also the group that would see its cost of insurance climb in a huge way. The uninsurance rate among people ages 50 to 64 who are below 200 percent of the federal poverty level would leap from 12 percent uninsured to 30 percent. Under the Republican bill, the deficit would shrink by $337 billion over 10 years, or $33.7 billion per year on average. That reduction would mainly come from the Medicaid rollback and, to a lesser degree, the end of Affordable Care Act subsidies. Both of those changes would reduce spending by a little more each year. All told, Medicaid savings will come out to $880 billion over the decade. That reflects the massive changes that will be made to Medicaid under the plan. Existing enrollees could stay on, but the expanded income threshold that the Affordable Care Act set would move. That would mean fewer people could sign on in the future. Not only that, but the new plan would cap how much the federal government spends on Medicaid, making it much more expensive for states to keep up current levels of coverage. A smaller deficit may make fiscal conservatives happy, but it's altogether a modest shift. The deficit reduction here averages out to $33.7 billion per year. For comparison, the 2016 deficit was $587 billion. An earlier version of this story incorrectly stated that a 64-year-old making $26,500 would pay around $1,700 a month in premiums. The cost would actually be $1,700 a year.